A few months ago we went on a picnic at the beautiful King’s Park in Perth with Brooke’s parents. To finish off with a sweet treat, Brooke’s Mum had brought along some Florentine biscuits. What’s not to love about this ultimate biscuit? 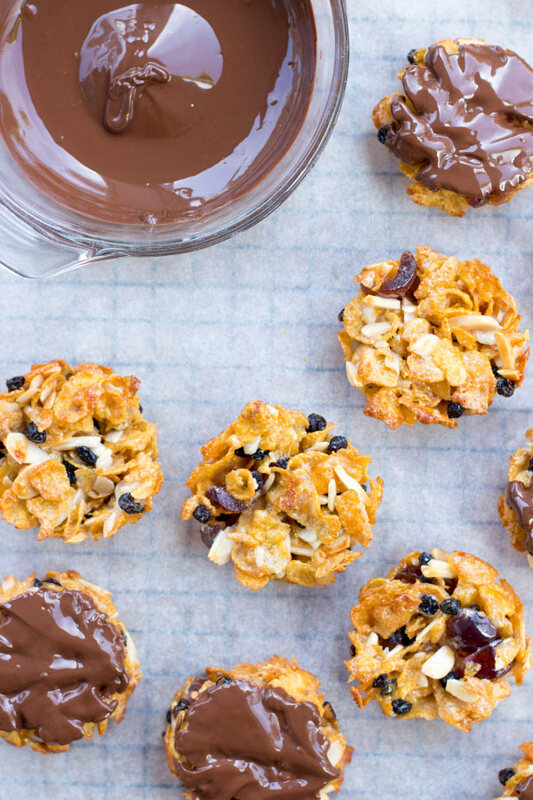 A Florentine biscuit or Florentines are made of nuts (most typically almond or hazel), glacier cherries, dried fruit and they are often coated on the bottom with chocolate. They are rich and indulgent and should have a nice crunch when you bite into them. 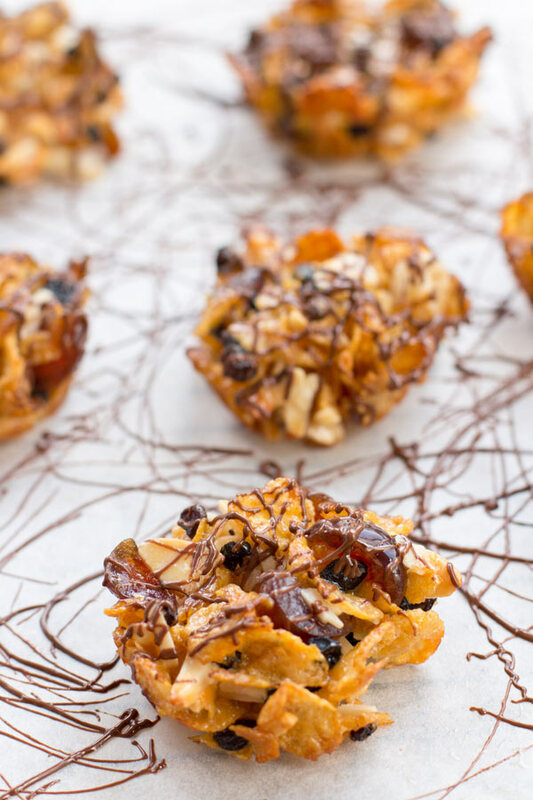 Their toffee-like texture and combination of Cornflakes in our recipe will also give you flashbacks to your childhood memories of Honey Joys – only now with a grown-up twist. Most recipes use melted butter, sugar, and honey as their binding agent. For us, we used a good old can of condensed milk. When adding your condensed milk, the key to making a successful Florentine is to ensure you coat the mixture enough to bind the ingredients. Adding too much will weigh your biscuit down or leave it soggy. You want to ensure you have the satisfying crunch at the end! 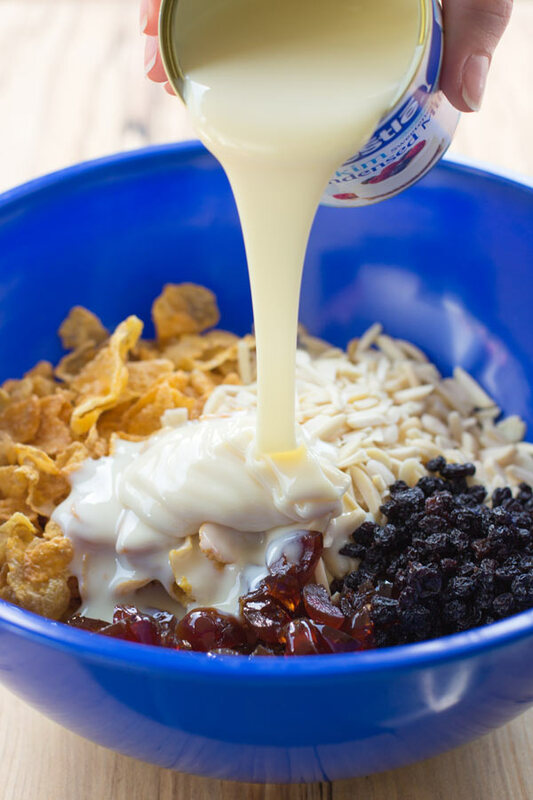 If you are worried you have added too much condensed milk, you can stir through some extra cornflakes to help absorb some of the additional liquid. Once your mixture is ready, spoon the mixture onto a lined baking tray or into a greased muffin tray like we did. Using the muffin tray keeps the biscuits in a nice uniformed shape and ensures you end up with 24 biscuits. Baking on a low heat for 10-12 minutes till golden-brown, will ensure you have a lovely chewy and crisp little caramel treat. Once removed from the oven, you can take these biscuits to another level adding a thin layer of dark chocolate on the bottom. Allow the chocolate to set then enjoy these decadent coffee shop biscuits with a cup of tea or coffee. Looking for another biscuit or cookie recipe then try our ginger nut biscuits, cranberry pistachio biscotti or oatmeal raisin cookies. 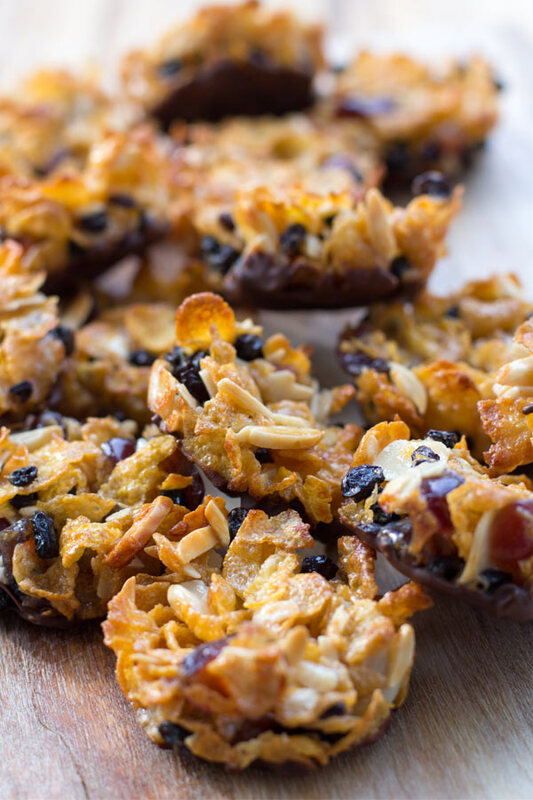 A Florentine biscuit or Florentines are made of nuts (most typically almond or hazel), glacier cherries, dried fruit and they are often coated on the bottom with chocolate. Combine the cornflakes, almonds, cherries, currants and condensed milk in a bowl. 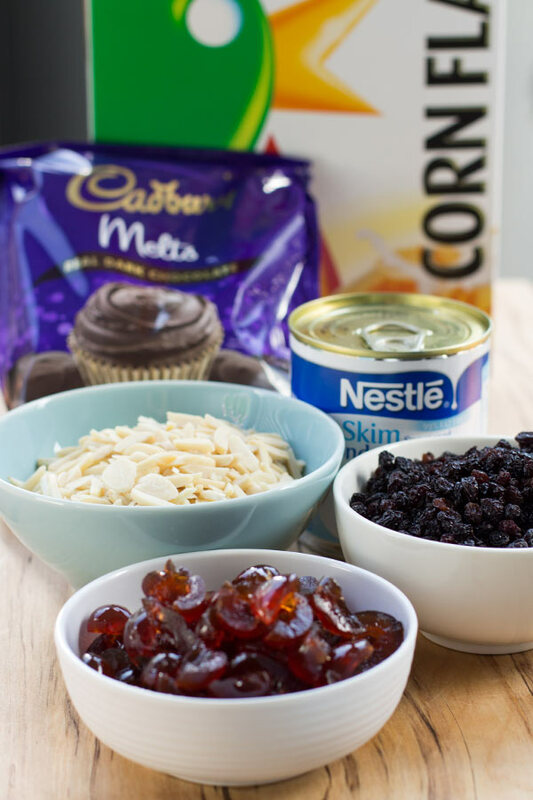 Mix until the ingredients are evenly coated. 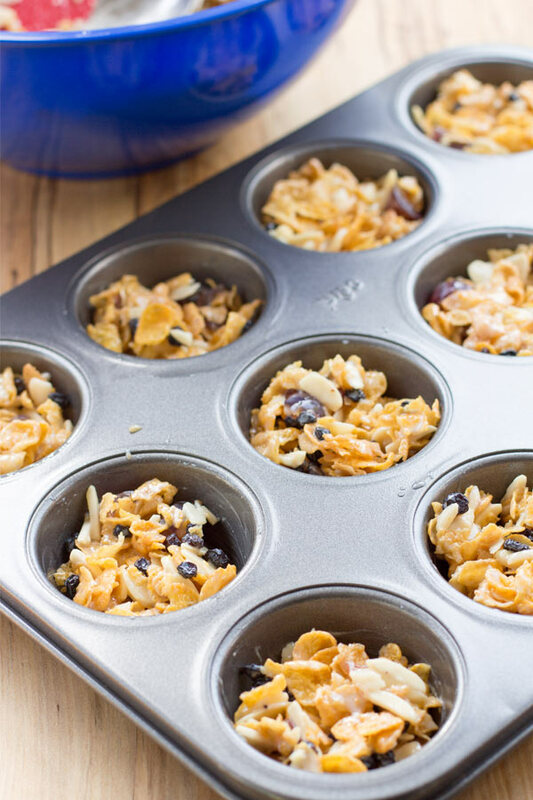 Spoon the mixture into a greased muffin tray and press lightly to ensure they are compact. Bake for 10-12 minutes until light golden brown, then set aside on a wire rack to cool. Melt the chocolate and drizzle over biscuits or dip the bottom. Place the biscuits chocolate side up, on a wire rack until set. The first time I tried this apricot couscous salad was only a couple of weeks ago when Brooke was preparing her lunch to take to work that week. 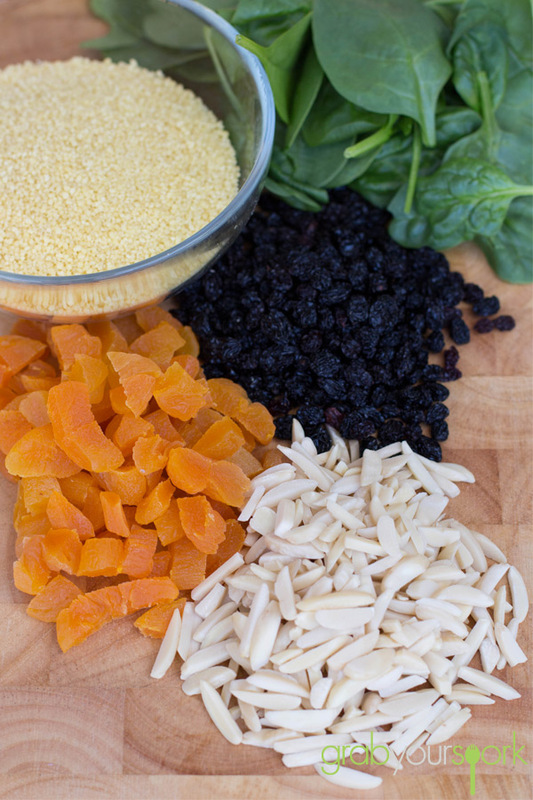 She started getting the ingredients out, couscous, dried apricots, currants, slivered almonds and baby spinach. Firstly fruit in a salad? I am not exactly sold on this idea, and of course Brooke started getting defensive when I questioned it. She said the first time she had this was when her Mum made it to accompany a Moroccan lamb dish to use instead of rice. She said the almonds give it a nice crunch, and the sweet apricots and currants add another flavour. Honestly, I was still not sold on it, till there was a chance I could have a packed lunch to take to work as well. As I watched Brooke make the salad I swear it was ready in 10 minutes. To start all she did was prepare some couscous using the method on the box. While this cooked, she simply toasted some slivered almonds on the stove till golden brown. 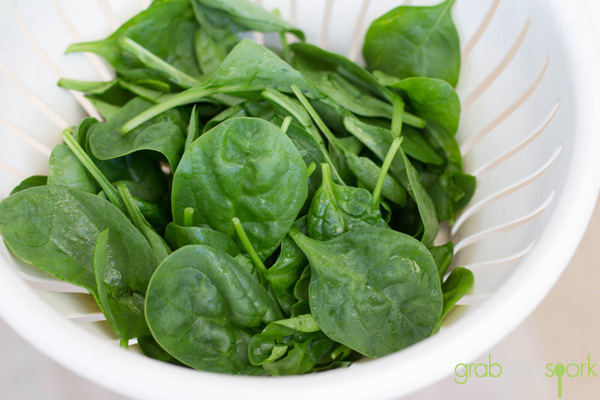 She then sliced up some dried apricots into small pieces, and then washed some baby spinach. 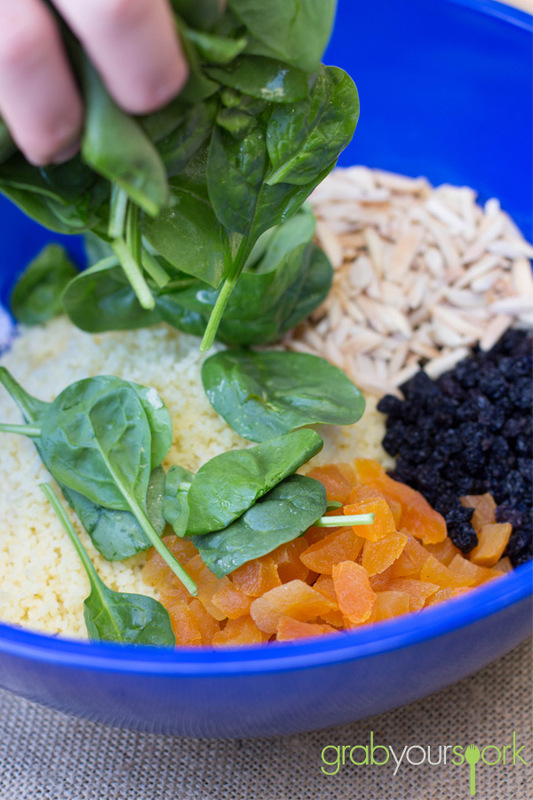 Once the couscous was ready and had cooled slightly all that needed to be done was mix it all together – couscous, almonds, apricots, spinach and a handful of currants. Really it was that simple! I must say I am now a fan! Although this version apricot couscous salad is served cold, it can still be served warm to accompany other dishes – like a Moroccan inspired dish which is full of various spices. I will however, recommend this coming into summer as a great side for any bbq or even just some marinated chicken. If you are looking for another salad recipe to accompany your meal then try our roasted pumpkin and feta salad. 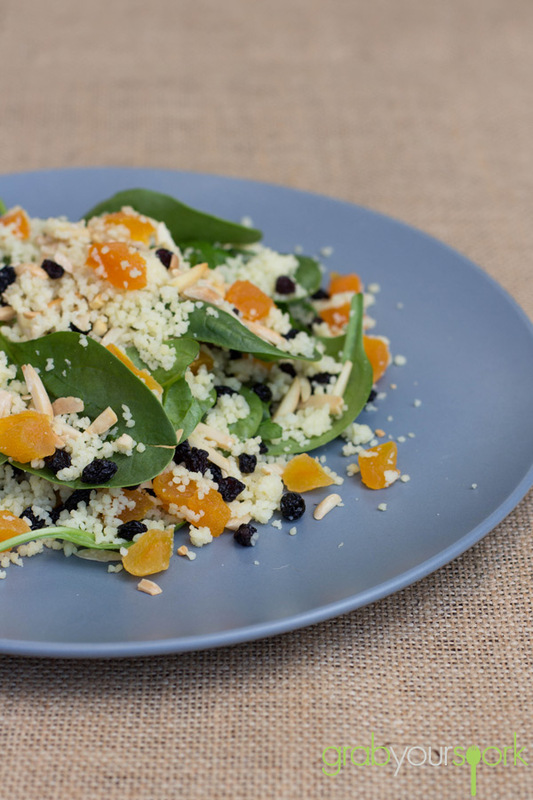 This simple Apricot Couscous Salad is made with just 5 key ingredients couscous, almonds, apricots, spinach and a handful of currants. 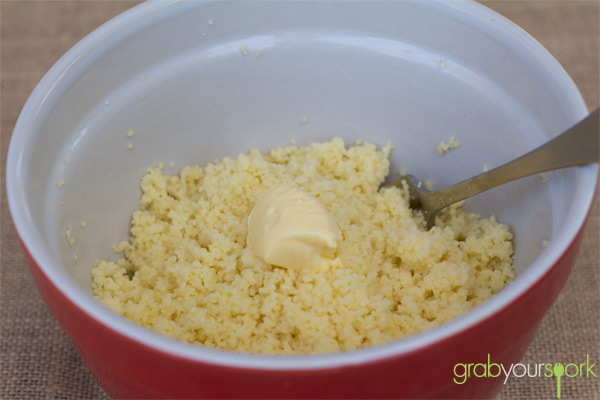 Prepare your couscous using the method on the box. Toast almonds in a small pan on the stove till golden brown, and allow to cool. After making the maple mixed nut granola last week Brooke still had a heap of leftover almonds. To try and get rid of the rest of them, I suggested using them to make some roasted honey ginger almonds. 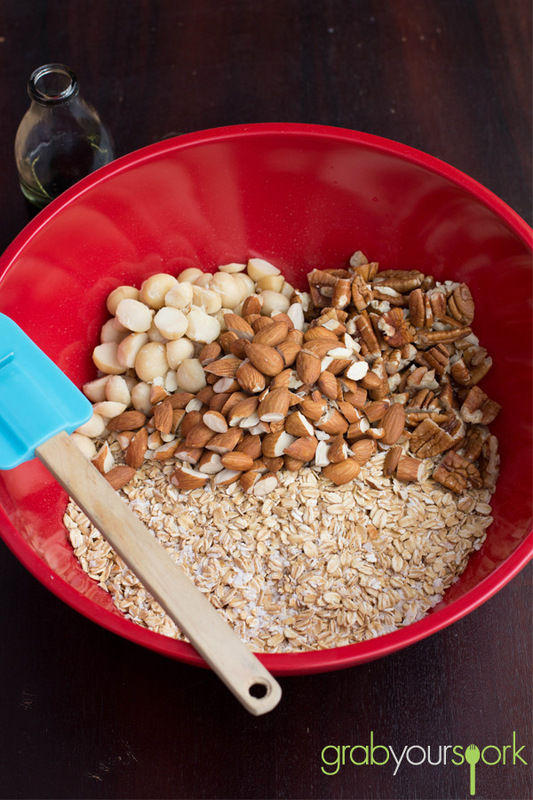 Now this recipe does not restrict you to only using almonds, but if you ever have nuts left over and want to make a great snack, this is a great way to make use of them. 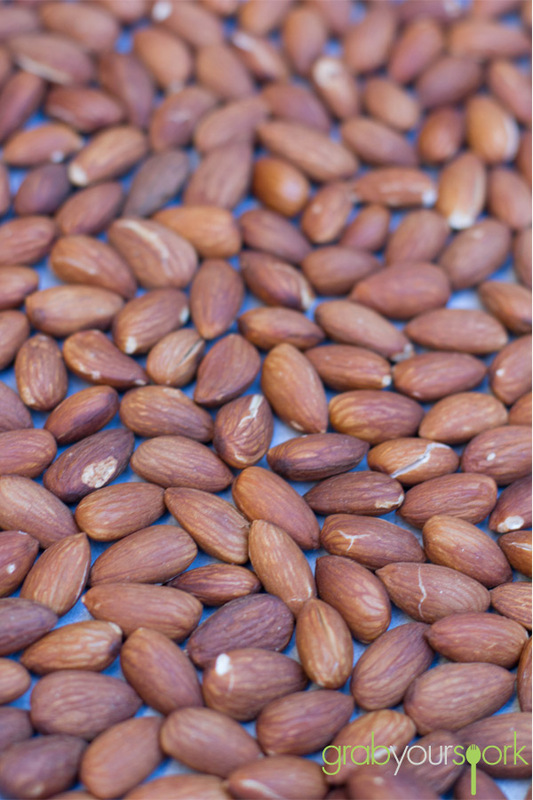 Now the beauty of using almonds is not only are they a nutritious and protein-packed snack. They also contain vitamin E, magnesium, fibre and are low in cholesterol. And of course through adding the wonderful flavours of honey and ginger you will end up with an easy-to-make addictive sweet and crunchy treat! 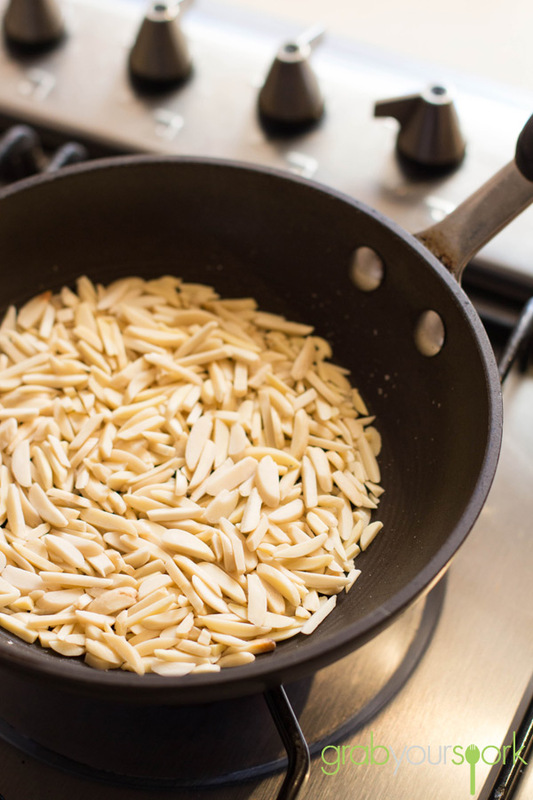 To start this recipe you need to roast the almonds first, before flavouring them. 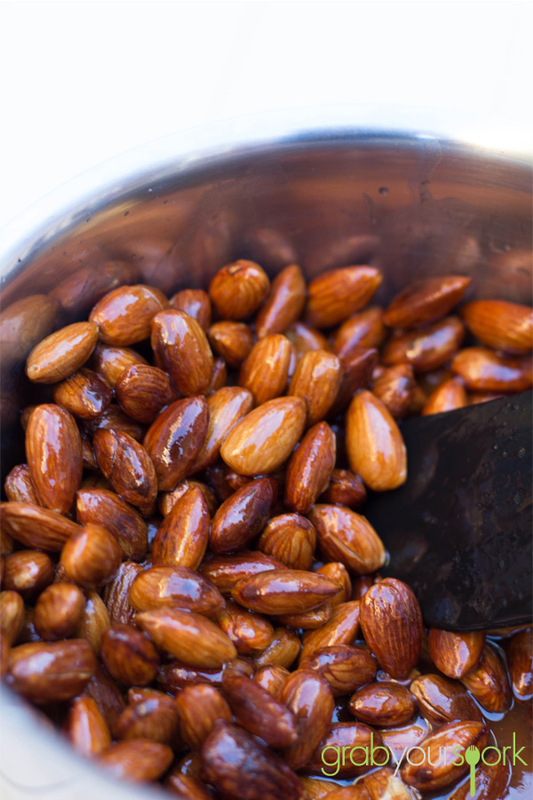 Through toasting the almonds first it will give them a better flavour, and enhance your recipe. 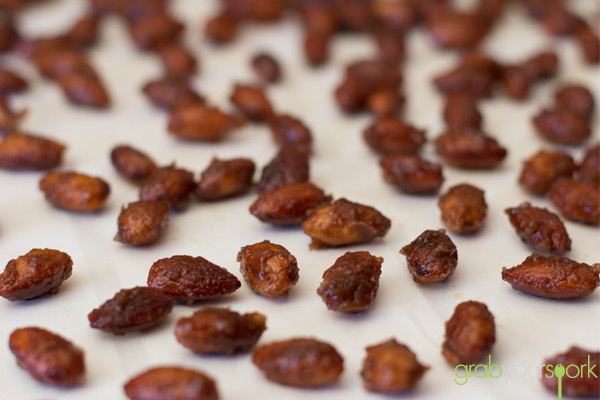 Once your almonds have been roasted and the skins have begun to crack, you can candy them on the stovetop before returning to the baking tray to let crisp. As I said before this recipe is easy and the flavours can be easily changed to suit your taste or even your preference of nuts! 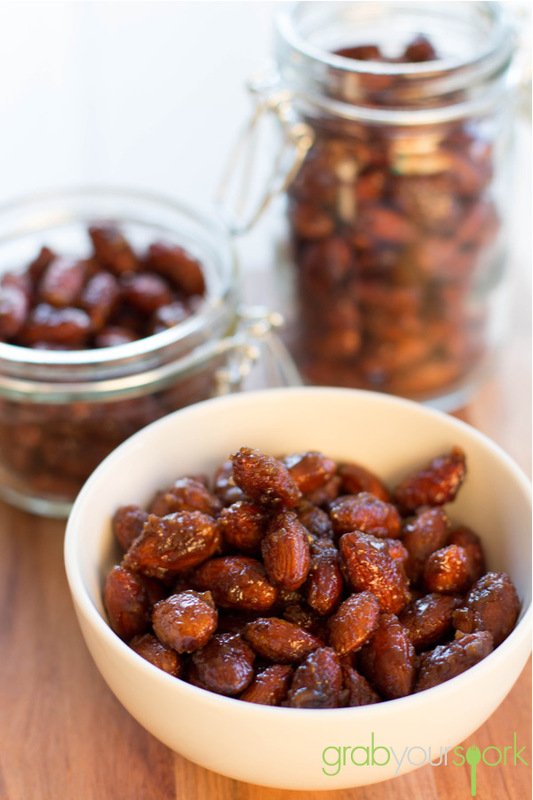 Roasted honey ginger almonds are a perfect snack for any occasion. If you are looking for another nut based recipe then try our pecan slice recipe. 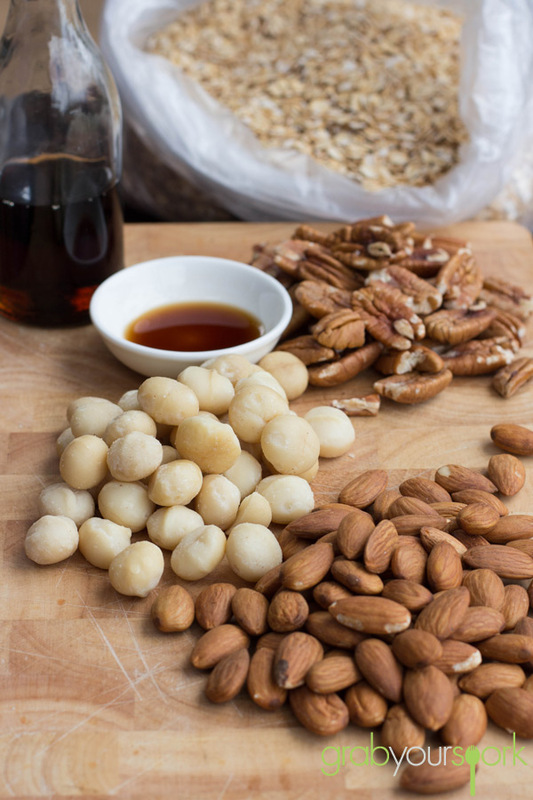 These Honey Ginger Almonds make a nutritious and flavoursome protein-packed snack. 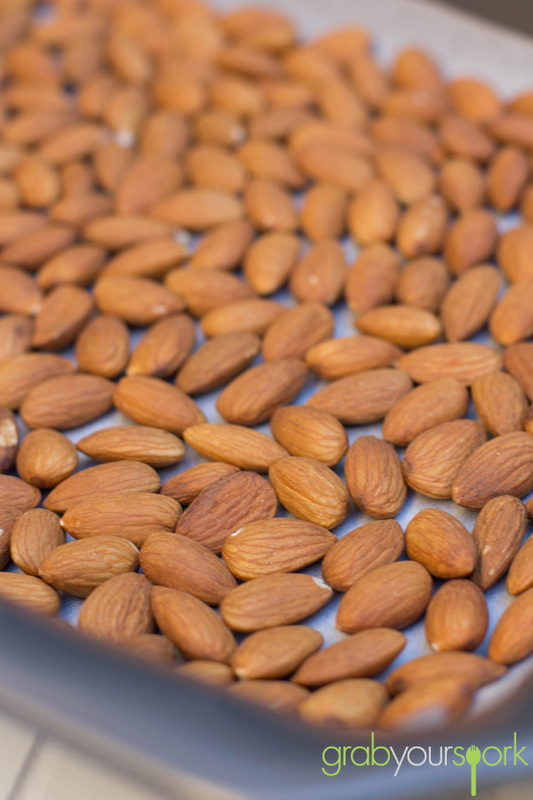 Place the almonds on a baking sheet and roast them in the oven at 325º for 10 to 15 minutes. Remove them from oven and set aside. In a small bowl combine the dark brown sugar, ground ginger and salt, grind the mixture with a fork until well combined, set aside. 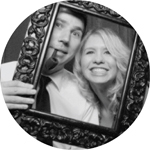 Over the past few weeks Brooke and I have been busier than ever. Between work, renovations and family commitments we have found ourselves eating whenever or whatever we can (well at least I have). As a result I had been craving something a tad bit healthier. Fortunately when Sunday morning came around Brooke had the perfect solution for us which was to make her maple mixed nut granola. Not only is it healthy but it is quick, easy, & delicious! So it ticks all the boxes. Once you have a taste of this homemade maple mixed nut granola, you won’t even care whether it’s healthy or not. I mean, seriously, its that yum. The crunchy texture of this granola will have you nibbling at it straight away (As Brooke caught me doing on several occasions). What’s great about this recipe? 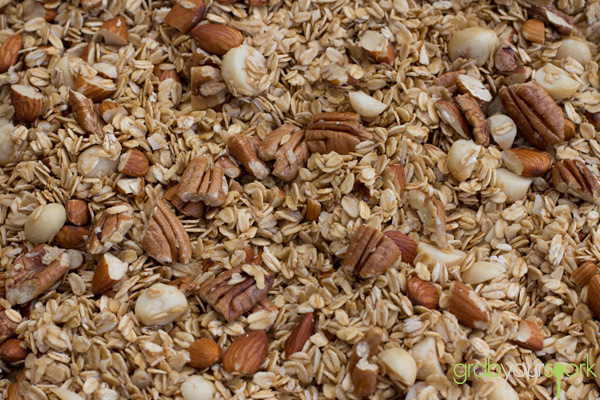 You can make this granola to your own liking by altering the type of nuts you use. More pecans, less almonds, you can even add dried fruit… it’s up to you. Then just add it to your cereal, yogurt, or some fresh fruit in the morning for a healthy start to the day. Brooke likes to make granola in large batches as it can be stored in airtight containers – meaning we can snack on it for a few weeks. If granola is not going to cut it then check out our Spanish baked eggs recipe or Tuscan baked beans recipe. 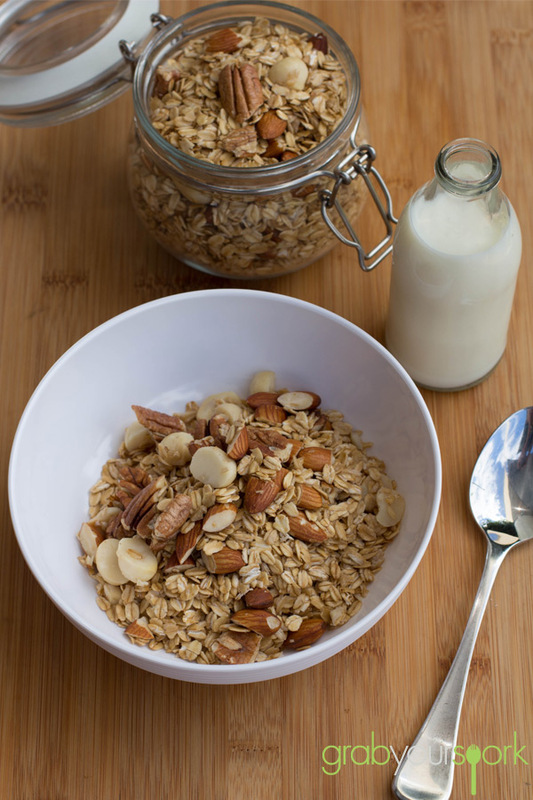 Maple Mixed Nut Granola. Not only is it healthy but it is quick, easy, & delicious! So it ticks all the boxes. Preheat oven to 160 degrees Celsius. 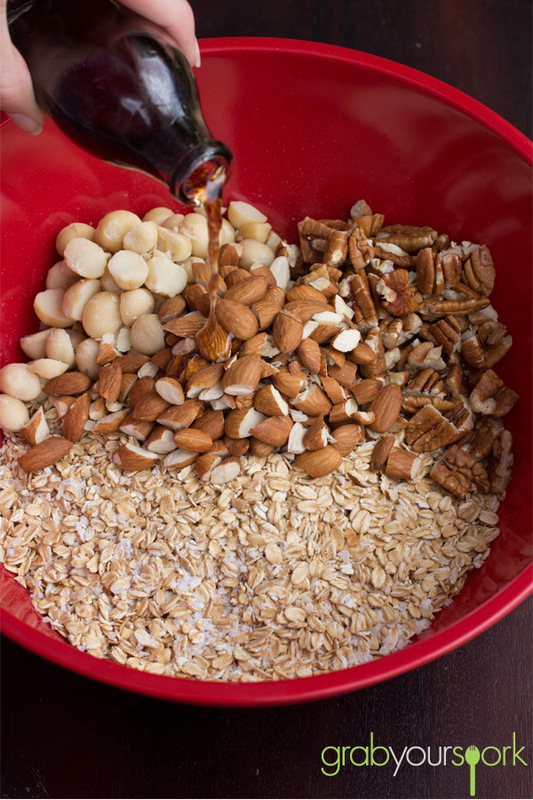 In a large bowl, toss together oats, pecans, almonds, macadamia nuts, salt, vegetable oil, maple syrup, and vanilla extract. Spread oat mixture on a rimmed baking sheet. Bake until golden brown, 25 to 30 minutes, rotating sheet halfway through. Let cool completely.